When I first saw this deal on Groupon (city - Seattle) - $15 for 12-Pack of Soda with Personalized Labels ($30 Value) or $8 for 6-Pack of Soda with Personalized Labels ($17 Value) at Jones Soda Co.- I just glanced at it and moved on. And then I gave it a moment's thought ... First of all, I have some of THOSE people on my gift giving list this year ... you know the ones, who need nothing, really want nothing, but still deserve a gift. 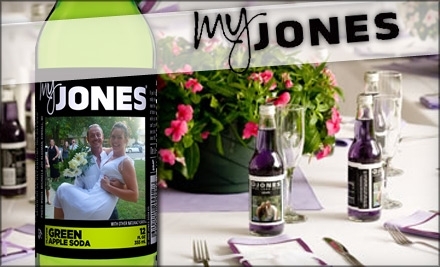 How many personalized bottles of Jones Soda do you think they have sitting around? See where I'm going? Perfect gift for that impossible to shop for person. Second, I remember as a kid buying my father Dad's Root Beer. Back then I didn't realize that everyone could buy Dad's Root Beer (pronounced with soft o please like foot, I'm from Wisconsin), I thought it was really special for us and our dad, and we kids practically floated out of the grocery store with pride with "our" soda. Which ties in with my first thought and the hard to shop for folks ... they've got kids and I'm pretty sure those kids will think this is very cool to have a bottle of soda with their family picture on it! Follow this link, then click on Seattle at the top of the page (view more cities) and join me in a collective sigh of relief as that hard to shop for person is crossed of the list (and in November even ... double sigh!). Ooh, I didn't see that! Take care, and have a great week! I'm a bit of a lurker, but your blog is definitely one of my favorites every day!! You have such a sunny outlook on life.